Installation of ENC charts in WinGPS. WinGPS 5 Pro 2018 or newer. WinGPS 5 Voyager 2018 or newer. WinGPS Inland Navigation - for commercial shipping. WinGPS ENC Viewer - free to download. Follow the steps below when you want to use ENC charts in WinGPS 5 or WinGPS ENC-Viewer. The S57 charts are free to download from the website of the government agencies of the country concerned. For the European inland waters visit www.vaarweginformatie.nl (Dutch) for an overview of all available Dutch ENC charts with extra links to all other available European ENC charts. Create a folder on your system to download your S57 chart files into. 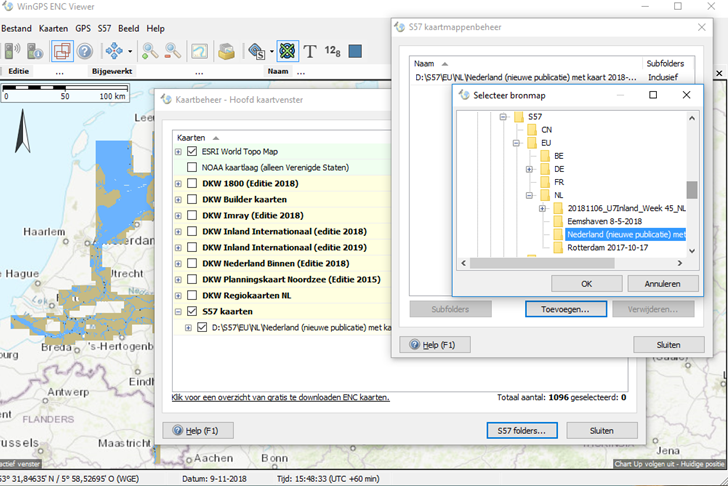 You could create a subdivision per land or region as the files are downloadable in that form. Download the ENC charts from the areas you wish to sail and save them in the correct folders you just created. S57 chart files have the .000 file extension (base file). Updates are extended with .001, .002 …etc. For a correct working of updated charts sets all available extensions need to be saved in the same folder. Most S57 charts, amongst which IENC chart files, are not updated with .001 files. In stead, the .000 file is replaced entirely. To add the ENC charts in WinGPS go to 'charts - chart manager'. With the ‘S57 folders..’ button you open the S57 chart folder manager. Here you can add or remove chart folders. The added chart folders are placed in the chart manager in the 'S57 charts' list.